Roofs come in many different colors – black, white, gray, sand, as well as custom colors. While colored roofs can aid in the aesthetics of the exterior of your building, white roof coatings provide the greatest amount of cost benefits. White roof coatings contain UV blocking pigments to protect your roof from the sun's destructive UV rays, which happen to be the leading cause of roof degradation. The UV blocking pigments also reflect a majority of the sun’s heat away from the building, allowing your building to remain cooler while using less air conditioning. This results in lower utility bills and a longer life span for your current air conditioning system. Studies show you can save a total of 7-15% of total cooling costs by using a white roof coating. Harbor Freight Tools installed a National Coatings white roof coating system and was pleased at the noticeably lower air temperature they experienced in their warehouse after the system was installed – click here to check it out. 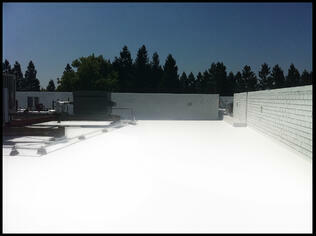 AcryShield white roof coatings can extend your roof indefinitely and are 50-70% less cost than replacing your roof. You are able to keep your business open as usual during installation to avoid any lose in sales or production. White roof coatings are spray applied directly over the existing, aged roofing substrate allowing contractors to save on installation time and building owners save money. 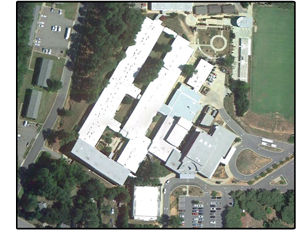 If you are interested in learning more about the benefits of white roof coatings, check out our article Life Cycle Cost Analysis Using Roof Coatings. Does Color Matter When it comes to Reflectivity of Roof Coatings? The short answer is, yes! White roof coatings provide the greatest reflectivity values available; however, that is not to say that other colors are not able to provide you with ideal reflectivity. Highly reflective roof coatings are full of UV blocking pigments that provide your roof with protection against premature degradation caused by the sun’s heat. 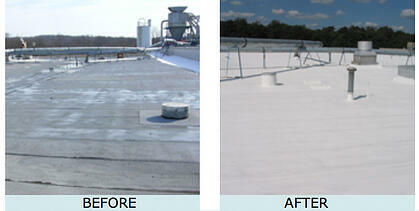 The greater amount of reflectivity the coating can provide, the longer your rooftop will survive. The added protection against the sun’s harsh elements can lower roof maintenance costs, lower energy consumption, extend the life of roof top mounted equipment and easily extend the roof’s lifespan. While roof coatings come in a large range of colors, choosing the whitest and brightest coating will provide you with the greatest reflectivity and protection to your roof. National Coatings has four standard roof coating colors – white, sand, light gray and dark gray (we can also custom color match most any color necessary to meet your needs); however, of these four standard colors, white is our most popular as it provides our customers with the greatest reflectivity benefits. If you take a look at our roof coatings that are tested and rated by the Cool Roof Rating Council (CRRC), you will see our AcryShield A510 has an initial solar reflectance of 0.84 in white and 0.72 in sand. This is true with any of the other coatings that come in multiple colors; the white roof coating is always the most reflective. Another factor to consider aside from color is, dirt pick-up resistance. Dirt pickup resistance is defined as having the ability to maintain it’s white color and appearance even after the roof has come in contact with dirt, dust, and other outside environmental conditions that could darken the surface. Long-term success of the coating you ultimately choose for your roof will greatly influence the cost savings and benefits you will gain. The CRRC is a great resource, as it not only provides initial testing but also 3-year, aged testing to determine the long-term reflective capabilities of the coating. National Coatings’ products are engineered to achieve success in regards to high reflectivity capabilities. The AcryShield roof coating line is packed with more UV blocking pigments, is richer in performance ingredients, contains excellent dirt pickup resistance and provides some of the highest reflective roof coatings available to the roofing industry. The AcryShield Ultra High Reflectance A590 coating, for instance, has an initial solar reflectance of 0.92 and 3-year, aged solar reflectance of 0.87 - the aged, 3-year result is higher than most roof coatings can provide initially. Since the mid-1950’s acrylic technology advanced to the capability of being able to transform into a waterborne emulsion. This was huge for creating extremely durable and protective paint use on the outside of homes and building and it has since become a resilient and long-lasting product for the roof coating industry. Acrylic material has excellent weathering properties and is extremely resistant to ultraviolet radiation from the sunlight. This makes acrylic roof coatings very durable and protective in nature. Sunlight or the sun’s heat is the leading cause of roof degradation and causes the greatest amount of damage to the roofs surface compared to any other element the roof encounters. The acrylic ingredient in roof coatings provides the building owner with the greatest protection, durability and strength to the roof, protecting the remainder of the building from water penetration, damage and more. Commercial roofing systems that are aged and deteriorating benefit greatly from an acrylic roof coating system as they are able to renew and restore their roof to new without tearing off the existing roof substrate. The acrylic roof coatings are applied directly on top of the current roof with a thickness of 15 to 30 mils. (Average exterior house paint is roughly 3 mils, so you can see the difference in strength, durability and protection from a roof coating compared to paint.) These roof coatings are liquid applied and form the roofing membrane on site with no seams. The acrylic roof coatings adhere to, waterproof and protect anything on top of the particular roof it is install onto. Not only do you, as the building owner, benefit from a custom tailored roofing system, meeting each and every need your particular roof may have, you also benefit from eliminating field or factory seams and mechanically fastened areas, both of which experience a lot of failure and aging issues as the flexibility of the roof membrane deteriorates, creating a perfect avenue for water penetration. Acrylic roof coatings provide excellent "cool roof" capabilities, as the acrylic polymers are transparent to UV radiation, prohibiting them from absorbing the sun’s destructive heat. These coatings can range from standard reflectivity to highly reflective coatings. The durablilty of the coatings allow them to remain flexible, constantly permitting the roof to expand and contract with the building during temperature fluctuations without cracking, split or alligorating. If you would like additional information on our acrylic roof coatings for restoring your commercial roofing system, download our FREE Product and Application Brochure or Contact one of our Roofing Professionals Today!